Satisfy the sweet tooth in a way that feels simultaneously indulgent and healthy. Doesn't sound possible, I know. 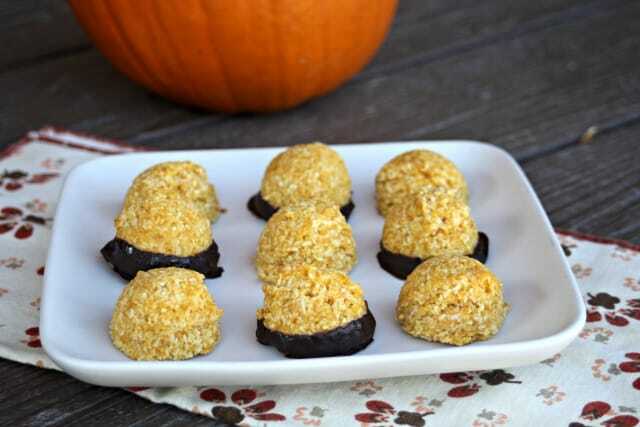 But these pumpkin coconut macaroons are indeed both. They're also gluten-free and vegan for occasions where those might be necessary. I know this time of year, screams for pumpkin spice everything. I'm a fan of itself myself adding to muffins, candy, and more. 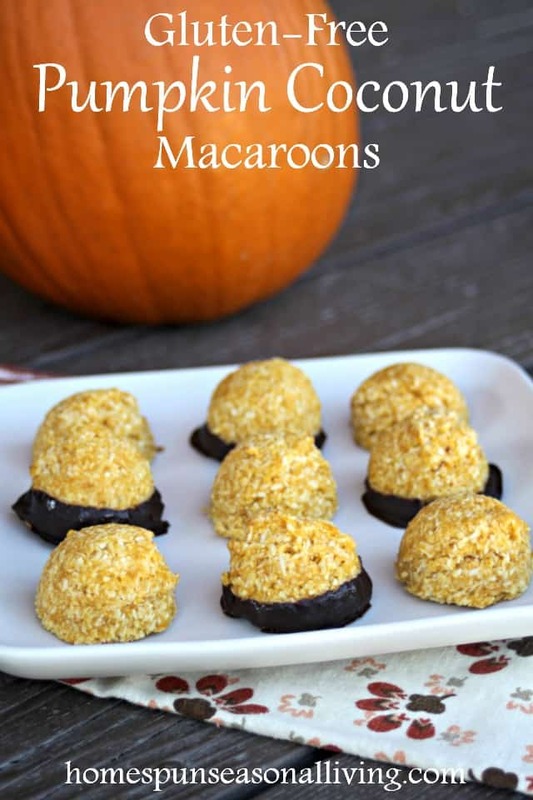 In these macaroons, however; I've skipped any spice to allow the coconut and pumpkin to be the dominant flavors. If that seems like too much of a sin, add ½ teaspoon of pumpkin spice with the starch. 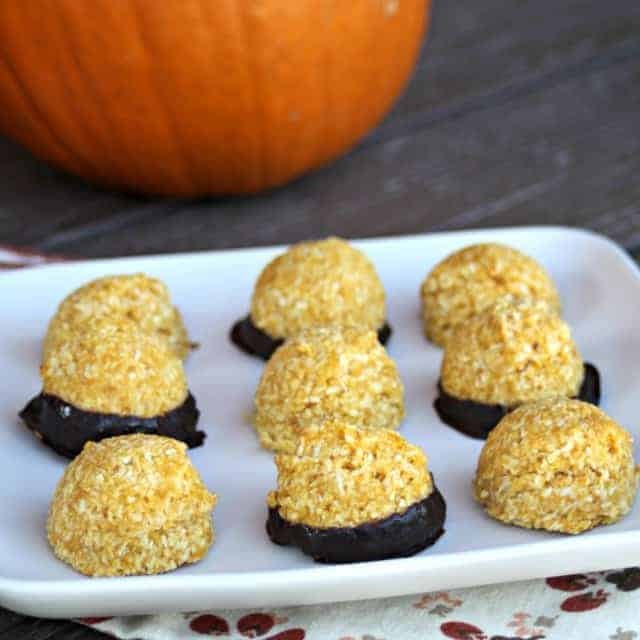 Canned pumpkin works perfectly in these cookies. However, most any cooked and pureed winter squash would also work. I've used lower salmon river squash and sweet meat squashes with great success. To give these macaroons just another bit of flavor, dip the baked cookie into dark or milk chocolate. I usually do about half in chocolate and half plain. Dip the flat bottoms and place onto to wax paper to harden. Alternatively, drizzle stripes of melted chocolate across the tops of the baked cookies. Pumpkin Coconut Macaroons are a delicately sweetened gluten-free and vegan fall-inspired cookie sure to soothe the sweet tooth and please a crowd. In a large bowl, whisk together the coconut, starch, and salt. Set aside. In a small bowl, whisk together the maple syrup and pumpkin until emulsified. Pour the wet ingredients into the dry and mix well. It will seem a little stiff. Form the batter into tight balls between the palm, or pack into a cookie scoop before placing on prepared baking sheet. The macaroons don't spread, feel free to place them close together on the pan. Bake in the preheated oven for 18 to 20 minutes or until edges are golden. Would corn starch work as a 1/1 substitution? I have squash and coconut, but not the tapioca starch. I haven’t tested it but my understanding is that it would definitely work 1/1. Yummy – thanks for the idea! We shared this with our FB readers at homesteadlady.com.